Home > Company News > Tender Library v2.0 is here! Since Thornton & Lowe was founded in 2009, our single focus has been to support our clients to win more contracts through the provision of sector-leading bid and support services. We have constantly sought to innovate and invest in technologies to help achieve this, and today we are delighted to introduce our new, improved second generation of our Tender Library software. Tender Library was initially developed six years ago to fulfil our own requirements. As our business grew, we had an increasing issue of how to manage a vast amount of bid information and content across an expanding client base. We simply could not find a solution that was right for us and the type of tenders we regularly complete – largely portal-based and content-heavy. Our bid team has extensive experience in both public sector procurement and commercial bidding, giving us a unique depth of knowledge and expertise which, combined with considerable investment, resulted in our first version of Tender Library. Initially, it was a search engine for bid content and proved an instant success with our bid writers, which provided the impetus for us to evolve and expand the system. Over the years, we built in user management for security then task management to facilitate and support bid management. We added our Bid/No Bid process to ensure we, and our clients, were correctly monitoring bid decisions. Finally, we added performance reports and monitoring systems. Over the years, we have provided our system to a wide range of our clients, from the largest PLCs and NHS Trusts to a diverse variety of SMEs. We have now used client feedback, as well as our own working knowledge of the system to completely review and refresh the software, resulting in a more streamlined version with increased usability. Marking this innovation and movement to a new era for our Tender Library, we have opened up the programme to make it accessible to a wider audience. 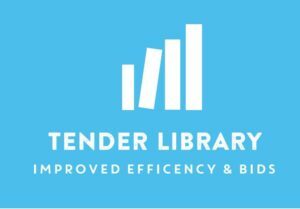 Whether your company has a team, or you are an individual bid writer, whether you work on several bids a day or a handful a year – Tender Library is a perfect tool to help you grow your business. The UK Government has set a target of increasing procurement spend with SMES to 33% by 2022. Despite this, the number of SMEs expressing an interest in public sector contracts has fallen by 10%. With Tender Library making bidding more efficient and successful, this software is an ideal solution to re-engage SMEs and benefit the whole supply chain. Priced at less than the cost of a cup of coffee daily, any company, no matter what size, can afford to benefit from this effective and efficient tender management system. So what, then, does Tender Library offer? Quite simply, bid management made easy. Our cloud-based, easy to use software makes writing tenders 30% more efficient for your bid team. It makes your bid information easily accessible, ensures regular improvement and preserves your bid continuity. How does it do all of this? At its heart lies a powerful Search Engine and File Management system, which helps you quickly find all relevant bid information with a single click – your previous bid responses and entire bids are easily accessible, with all your bid content and supporting documents stored in one easy to navigate system. Save time by having all your responses to standard questions and all regularly used supporting documents stored in one place, and your previous content – and resulting feedback – may be used as a starting point for new responses. Our built in Bid/No Bid system allows you to review your likely chances of success for each tender you might choose to bid for in a consistent and methodical manner. Easily managed from one dashboard, your whole team can be engaged in the process, and with an effective reporting strategy in place, lessons can be learned from each bid decision. Choosing the right tender to bid for allows you to target your resources in the most efficient and productive manner. A bespoke Task Management system allows your team to manage all bid related tasks across multiple tenders from an easy to use dashboard. Structured to prioritise tasks and enhance interaction between all team members, a traffic light system – red, orange and green – makes it easy for each member of a bid team to understand their role, tasks they are required to complete and approaching deadlines. This ensures that a clear system in in place for each bid – across multiple tenders – and eliminates time-consuming chasing of colleagues for information or confusion regarding responsibilities, which may prove costly in terms of efficiency and achievement. A team’s performance may be overseen at a glance, allowing leaders to monitor the efficacy and attainment of the team as individuals and as a whole. Tender Library allows you to preserve your Bid Continuity. Your bid information is a valuable resource and ought not to be dependent on an individual person. Should an employee leave the company, take annual leave or even fall ill unexpectedly – particularly if that person is solely responsible for completing bids or part of a small team – this might have a catastrophic effect on an organisation’s ability to complete bids. This vital information must be stored in an easily accessible format – and Tender Library allows even a new member of staff to easily find and access key information through the file management system. Seen as a whole, the base components of the Tender Library fulfil a variety of functions in a widely effective tender management system. Accessible anywhere and anytime, the easy to use format is an ideal tool in the arsenal of any bid professional, whether as an individual or part of a team of any size. A powerful search function combined with an exceptional file management system means that all of your valuable bid data is merely a click or two away. The Bid/No Bid dashboard allows you to use your information to target your resources most effectively by assessing your likely win rate before deciding to bid. The deadline-focused bid and task management dashboard also provides performance monitoring and ensures that all members of a team are functioning to their most potent capacity. The software as a whole ensures the protection of your valuable bid information and the continuation of your bid capacity. Now, all organisations of whatever size and scope may benefit from our years of experience and expertise in the bid writing and tender management fields and purchase this software to improve their writing efficiency and protect their bid continuity. Priced from just £850.00 a year, with a full 30-day money back guarantee, why not get in touch today to book your demonstration? The price includes online training, a User Guide, ongoing technical support –and we will even upload your first three tenders for you. Email hello@thorntonandlowe.com or call 01204 238046 to speak to one of our team.